A broken life line is when a section of the line is missing before the line continues. It might also look like two parallel lines. Sometimes the line appears to be short. 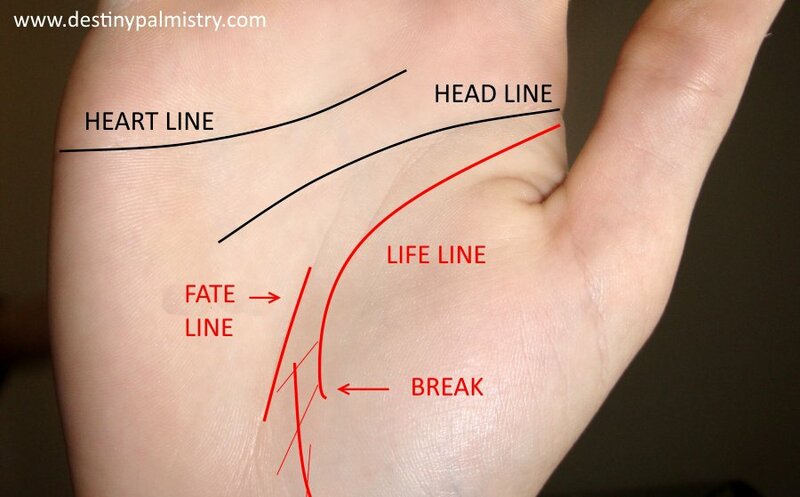 The life line is the line which wraps around the ball of the thumb on the palm. An overlapping break shows a planned change. A clean break may be showing that change is necessary; whether due to relocation, illness, accident or other experience, it serves as a cautionary to take more care during that time. The reason why a break in a line depicts change is that the proper flow of the energy is interrupted, leaving a space which may necessitate a decision for transformation or a breather in life. If the line continues actively after the break, it shows the usual flow of things are resumed. If not, look for a bridge line (often very faint) that connects to the fate line. In many cases, the fate line acts as a life line to support a change in a new direction. Also, see if there are sister lines on one or both sides of the broken life line; these lines give support to an otherwise uncertain period. A line on the inside of the life line would show family support and on the outside from a non-related source. If the break happens to overlap another part of the line, it often indicates a planned change. The first line a person typically looks at on the palm is the line of life. 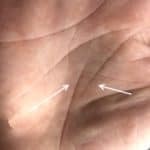 It is also frequently the most prominent line on the palm as it arcs around the mount of Venus, reaching somewhere near the wrist. The line of life is not an indicator of longevity. What it does reveal, however, is the quality of your life. Get Destiny palmistry Character Awareness here. Get Destiny palmistry 2 ‘All the Lines’ here. Have your personal palm reading, see more here. Subscribe to free Palmistry lesson on our Youtube channel. Previous PostPrevious The Career in Palmistry – What Suits Your Style? Next PostNext Does a Long Head Line Show Intelligence?